My Sewing Book Club and how you can start your own! You may have read in previous posts that I am part of a local sewing group that gets together a couple times a month for various sewing extravaganzas. Well, as part of that sewing group, my friend Susan and I began a Sewing Book Club of sorts and dubbed it BiblioStyles (a mash up of “bibliophiles” and the name of our sewing group, Sewing with Style). We had our first meeting in March and I’m just now getting around to blogging about it. Our first get together was a little small – only four people but I have no doubt that it will grow over time as we cover some popular books. I’m going to let Susan explain the details of the club and perhaps give you an idea to start your own where you live (or maybe even an online one, who knows??). Susan blogs over at MoonThirty.com and writes about all kinds of sewing, crafts, recipes and has many a sewing book review to boot. ***Mixed in this post are photos from our first meeting (Fabric by Fabric: One Yard Wonders) and projects made by the participants. Ok, first let’s get to know you: What’s your sewing experience? What do you like to sew? Why did you start your blog? I played around a little bit with sewing as a kid then went through a looong hiatus. For some reason one day in early ’09, and I still don’t know exactly what triggered it, I was struck with a strong desire to learn to sew. I bought a cheap Kenmore machine just in case I didn’t end up sticking with it. I bought a couple of beginner sewing books and worked my way through those (along with lots of Internet tutorials). Then I branched out into garments about 6 months later. I’m still much more confident with bags and home dec stuff than I am with apparel, but I love doing both. I’ve wanted to write a blog for many years now; even before I began to sew, I tossed around the idea of starting a baking/cooking blog. I suppose that I just wasn’t really motivated to do it until now. My goal is to inspire others with my projects and patterns, just as I have been (and continue to be) so inspired by the incredible crafting community. What gave you the idea to have a sewing book club? I’ve always loved book clubs. But these days I read very few novels — when I curl up with a book, it’s almost always a sewing project book (or the occasional cookbook). When I joined our local sewing group, I found a great group of folks who loves to talk about this craft as much as I do. So, making the leap to the book club felt like a natural next step to me. What do you like about the group sewing experience? I really love getting others’ input and feedback from their experiences with the projects I want to try. It’s also an awesome way to get more out of my sewing book library — I now want to tackle projects that I didn’t necessarily consider before I saw them made up. Right now, our goal is to meet once per month. We’ll feel it out as we go… If it’s too much, we’ll move to bimonthly. What did you make from Fabric by Fabric: One Yard Wonders? I had so much fun with this book! I started with the “Gazillions of Gathers” shirred pillow, which I made twice. I also made the “Day Out Bag” and several pieces of the “Jet Set.” I had great results from all of these, and there are quite a few more I still want to make. What’s the process for choosing books? And what are some upcoming books for the club? We’ve started by trying to choose books that have a wide appeal. That was what was so great about Fabric-by-Fabric — its variety of projects for a range of skill levels. Of course, no single subject will appeal to everyone, so we also plan to alternate months between the crafting and apparel books. Offering a range of difficulty is part of that mass appeal. A few of the upcoming selections include Lunch Bags!, The BurdaStyle Handbook, and Sewing in a Straight Line. We also intend to have some meetings where we combine books with a commonality (The Bag Making Bible and A Bag for All Reasons, Built by Wendy series, etc. ), as well as “theme meetings,” such as fitting books, couture technique books, etc. What are some ways that readers can form their own sewing book club in their own town? 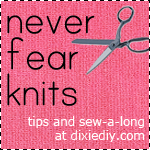 Go for it — sewing book clubs rule! It has worked really well for us to be teamed up with a local fabric store. It’s mutually beneficial, as they are able to provide a great space and the meetings help bring them business. We also set up a deal where our host store offers a discount on the meeting book to our members. Aside from having a great location, I’d say the other important piece is just getting the word out. We use Meetup.com as our platform, but it could also be beneficial to put up a flyer on an approved bulletin board at your local library or community college, for instance. As far as the meetings themselves go, they really don’t need a lot of choreographing. We tend to use a round-table format to share our projects and our results, and the open conversation is awesome. Actually, this is one of the examples where we depart from the format of a regular book club: even those who don’t have the book or who haven’t tried anything from it are encouraged to attend. The discussion can help participants decide whether to purchase the book. Anyone who loves crafting has value to add to the conversation! ***Big thanks to Susan for essentially writing this post for me, haha. 😉 Check out her blog and her series on basic tote bag sewing. This lady is a handbag making queen. Also, there was another participant who made different bag from the book but I completely forgot to photograph it, sorry! Our next book is Lunch Bags. I plan on making a sandwich wrap and snack bags. We pushed the Colette Sewing Handbook back because of schedule conflicts but I’ll be sure to share any and all projects I make for BiblioStyles. Oh, and if you’re in the Austin, TX area and want to join in the fun we’d be glad to see you!